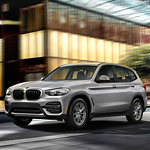 US News & World Report rated the BMW X3 in the top five of all luxury class compact SUVs. This is due to its incredible power even in the base engine, which has 245 horsepower. You can upgrade to the sDrive30i and increase your horsepower with a rear-wheel drive configuration. Want driver safety features? The X3 now comes standard with even more driver assistance features. You can see it all and take a test drive when you stop by BMW of Fairfax. Schedule your appointment online today.